With the theme of “Next in Blockchain”, hosted by the World Blockchain Council and GMGC, The World Blockchain Conference, Singapore was held at Pan Pacific Hotel on July 17-18, 2018. Over 1500 professionals from the Government and Blockchain companies, related applications experts, investors, and technical communities from more than 30 countries in the world, including Tencent blockchain, Baidu financial blockchain, and Sophon capital community, participated in the discussion of the future trends of global blockchain technology and applications. 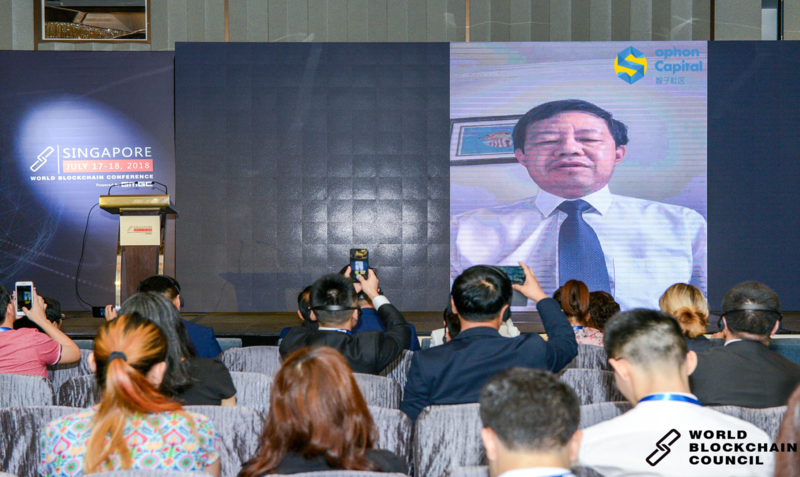 Mr. Frank Zheng, strategic advisor of Sophon capital community, delivered a warm speech at the opening ceremony. The guests explored the practical significance of blockchain scenarios and applications around the next generation of blockchain technology, artificial intelligence, cross-border integration of blockchain, and policy supervision. The concept of “blockchain+AI” will once again attract investors’ attention and lead the digital currency trading market out of the trough to the bull market. The Sophon Capital Community seems to stand a chance to fly when there are favorable winds, blockchain and artificial intelligence, blowing from behind. With some distinguished superiorities, people may find some clues of SAIT (Token of Sophon) for the birds of the next BTC. Sophon capital community hired blockchain and digital currency field experts represented by Mr. Bai Shuo, the former chief engineer of the Shanghai Stock Exchange, Mr. Yuan Dao, token economy expert, Mr. Jeff Chang, the founder of NEBULA Digital Assets Fund, Ms. Chen Ran, the investment banker, Mr. Xin Weimin, the founder and CEO of StarryMedia., Mr. Frank Zheng, Secretary-general of World Blockchain Organization, and Dr. SM Yiu, professor of University of Hong Kong, as the consultant team to provide the most professional advice and service for the community from the technical, strategic and operational aspects. Knowledge sharing is widespread in collaborative relationships. When knowledge is compiled to form intelligence, some resistance in knowledge sharing will be met. Each party has their own knowledge and hopes to carry out deep mining of knowledge through cooperation. However, not all participants wish their raw data to be seen by others. This problem can be solved by employing a back-to-back knowledge sharing network (secure multi-party computation). Specifically, in the back-to-back knowledge sharing network, every knowledge provider corresponds to a node, and P2P communications and transactions can occur between nodes. This prevents interception and replication of data by centralized nodes. At the same time, smart contracts are used to achieve secure sharing and calculation of data from various parties. Community users may include investors, blockchain experts, project parties, media, and exchanges, and other individuals or organizations in the digital asset field. These users may be both knowledge providers and knowledge consumers in the community. The community invites currency investment experts and VIPs with influence and experience and utilizes the cumulative knowledge of the operations team in investor protection and education to carry out investor protection and education activities through community discussions, online and offline activities, and live broadcasts. Knowledge graph technology is also used to provide personalized tests and tailored educational training programs for amateur investors. This individualized education helps these investors get started and rapidly grasp currency and blockchain knowledge, which provides a basic introduction and solves the pain point of insufficient education of market investors. In terms of ecological development, Sophon capital community encourages participants to share knowledge and consume knowledge by a sound incentive mechanism to promote the development of the community ecosystem. In accordance to the standards by the Swiss Financial Market Supervisory Authority (FINMA), SAIT token are categorized as payment tokens, and the value is reflected by the payment scenario which includes two parts, internal growth circulation and external growth circulation. In terms of internal circulation, all services in the community must be paid by the token; the external circulation is more distinctive, as the community can drive traffic for small and medium-sized exchanges, and only SAIT is the only means of payment, so the demand of SAIT is large. The community encourages users to voluntarily lock positions by holding a certain percentage of SAIT in the form of community services (such as some high-end strategies services and asset allocation). Now, the beta version of Sophon capital community website has been launched. Welcome to find Diamond in the rough. Sophon Capital Community is the world’s first intelligence digital asset investment community that integrates investor education and protection, intelligent rating of ICO projects, smart investment, and intelligent digital capital management.